Today, Disney revealed a new Vinylmation platform called Meet and Greet Mickey. It will debut at the 13 Reflections of Evil event being held September 13-15, 2013, at Epcot. The limited edition figure will stand about six inches tall, and will have an edition size of 500. Each figure will retail for $49.95 plus tax, and will be packaged with an individually numbered header card. First, take a read of the Disney Parks Blog article before I give my two cents. “We call this new figure ‘Meet & Greet Mickey,’” explained Thomas. “Many fans may recall that the blank Mickey Mouse shape, or ‘platform,’ as I call them, was the foundation of Vinylmation. We’ll continue using that shape to create 3-inch figures. 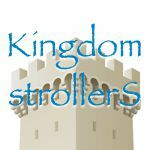 We’ve actually introduced a few different platforms in recent years, such as Vinylmation 95, Park Starz and even Popcorns. With the fifth anniversary of Vinylmation in November this year, it seemed like a great time to try something new using Mickey.” This time, instead of a blank canvas, Meet & Greet Mickey is a fully detailed figure which Thomas feels “will appeal to guests who love the Disney Parks.” “The first ‘Meet & Greet Mickey’ will be released during our annual trading event at Epcot,” continued Thomas. “The figure is colored to compliment this year’s event theme, 13 Reflections of Evil. As this platform was designed with collectors in mind, there are only a handful of additional figures planned in the coming year. 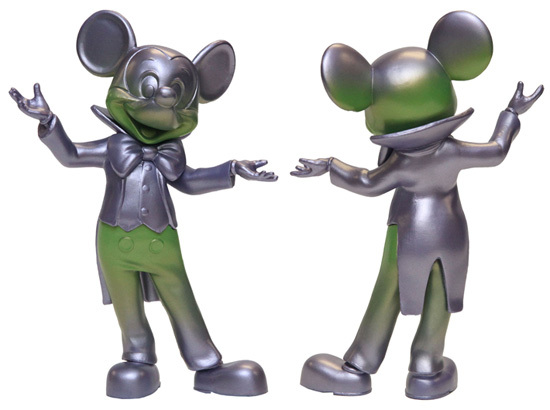 Fans may see future ‘Meet & Greet Mickey’ figures released at events like Disney Trading Nights or the upcoming Festival of the Masters 2013 on November 8-13 in the Downtown Disney area at Walt Disney World Resort. Thomas said the Mickey Mouse-shaped form will stay the same, yet the colors will change with each new release. No colors will be repeated. The figures are limited edition, which means that once a particular figure is sold out, it won’t be reintroduced. I appreciate new ideas incorporated into the Vinylmation line. I may not collect all of the various platforms, but I like the fact that we have them and artists try new things. I really like the idea of Meet and Greet Mickey. I think the design looks extraordinary and perfectly represents a walk around costume character of the 1970’s. A collectible like this just doesn’t belong in my collection. Possibly if it was a Donald Duck, I would think differently. But even then, a silver figure with a hue of green on it is not enough for me to take my wallet out. I am a collector, but I don’t collect for the sake of an item being LE and branded “a collectible.” I collect the original Mickey shaped 3″ Vinylmation because the figure itself is just a canvas and the artists use imagination to give them character that appeal to me. This feels like the canvas is trying too hard to BE the character and it doesn’t matter what is painted upon it. Meet and Greet Mickey would appeal to me if they were painted upon with designs, whether it be park or artistic. I would not buy them, but at least then, I would be more able to appreciate the artist value and collectibility of the figure. The way it is, I see the appeal of the figure itself, but not how it is used. I don’t get it. How is this a “platform.” It’s a nice Mickey figure with an ugly paint job. I think it’s a platform because they say it is. It’s kinda like “art”, once someone calls something art, it’s art. $50 is WAY overpriced!! At $24.95 or less and painted with proper colors, I would add it to my collection. A couple wisps of a single color, even at LE500, does not justify the high price…..unless the gray is platinum plating.